1. What exactly do we mean by a condition commonly called “varicose”? Varicose veins of the lower limbs is often the network visible, bluish, dilated and tortuous veins or single, curved lines along the calf, in the crook of the knee or on the thighs. 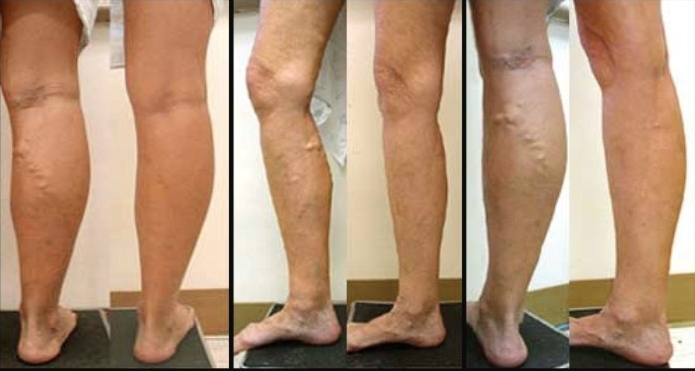 The presence of varicose veins is a testament to the emergence and the development of chronic venous insufficiency. Additional symptoms may be too often a feeling of heaviness in the legs, itchy skin, leg cramps, pain, or swelling of the ankles. 2. Is it possible to prevent the formation of varicose veins? Are varicose veins are hereditary or acquired affliction? Varicose veins can be hereditary affliction, but it is also a lot of different factors that contribute to the formation of varicose veins such as age, lifestyle, environment, history of phlebitis, hormonal medications (such as birth control pills), obesity or pregnancy. Unfortunately, not all of these factors can have an impact, such as genetic heredity, environment or pregnancy. Some ways to prevent venous disease include physical activity such as walking, recreational cycling, swimming, quitting smoking, as well as the introduction of a proper diet to prevent weight gain. 3. What are the consequences involve any untreated varicose veins? Previously it was thought that varicose veins are only a cosmetic issue. Today we know already that can cause many health complications such as skin diseases such as eczema or ulcers, and even cause health risks such as in the case of phlebitis, thrombosis or embolism possible. 4. Is surgery the only way to remove varicose veins? Unfortunately, yes. The operation, but rather a laser ablation (abbreviated EVLT), which we offer in our clinic, is currently the most popular and common method of treating varicose veins in the world, so-called “gold standard”. This procedure consists of introducing fine fiber laser incompetent vein through a small puncture. After application of local anesthesia, the laser starts and slowly withdraw the fiber by closing the diseased vein, often from the estuary. During this surgery, the patient remains awake all the time, in contrast to the classical method called “stripping”, which is used mostly general anesthesia. Traditional vein surgery using the “stripping” is literally pulling incompetent vein with a wire probe after previous skin incision. The final and most important differences between the two methods lies in the fact that after “stripping” recovery period is much longer and there is a much greater risk of recurrent varicose veins than EVLT method. Additional and often complementary treatments for varicose veins are also Phlebectomy and Sclerotherapy. 5. Is leg cramps are just lack of potassium or longer signal forming varicose veins? Causes of muscle spasms in the legs can be many. These contractions may result from a shortage of electrolytes in the body, including potassium or magnesium salts, myositis, viral hypothyroidism, diabetic neuropathy or alcoholism. Cramps can also be caused by vascular disorders in both arteries when it comes to ischemia and veins, caused by heart failure in the system. Leg cramps may therefore also be a signal forming varicose veins. 6. Spider veins is another issue that ladies are fighting, and that makes the legs look the naughty. Which are the most effective ways to remove them? Spider veins is a problem for many women and therefore often ladies are looking for effective ways to get rid of them. Telangiectasia, commonly known as spider veins, are small bluish or red, enlarged blood veins that occur on the legs, close to the skin surface and therefore often unfortunately very conspicuous. They usually do not cause any symptoms and if you are not accompanied by symptoms of chronic venous disease, they are only considered as a cosmetic defect. Currently, the most popular, effective treatment for spider veins is sclerotherapy cosmetic. 7. Sclerotherapy Cosmetic – what is it? Sclerotherapy is a widely used method of treatment “spider veins” or otherwise telangiectasia. It involves injecting a drug, so called Sclerosants, a cell with a small venous needle, which no longer causes the blood to flow therein. Then, the dish is slowly fibrosis and completely absorbed by the body. As in the case of laser ablation of incompetent veins, during this treatment, it is also the use of trouble with medical stockings or tights after surgery. 8. Is closing venous laser is safe? Yes. Application of laser allows you to perform the surgery without general anesthesia, there is no need to violations of skins, which significantly reduces the possibility of complications after surgery. In contrast to the previously used method of operating the laser ablation, the patient returns to normal daily activities within a few hours. 9. Are laser treatments are covered by insurance? And what about patients who do not have insurance and are not able to pay cash for the procedure? Yes. Treatment of varicose veins using laser technology as well as Phlebectomy and Sclerotherapy are covered by most insurance. If you have health insurance does not have insurance or do not want to cover the costs associated with the treatment of varicose veins, then accept a fee for each completed treatment in the form of cash or credit card. 10. What is the difference between Chicago Vein Care Center and your competition? Unlike its competition, Chicago Vein Care Center use the latest, minimally invasive laser ablation method using ultrasound, accurately monitoring the course of treatment. With used by our surgical technique, surgery is performed on an outpatient basis, without having to stay in hospital and excludes the need to take painkillers during the postoperative period. Immediately after surgery, the patient returns home, to their daily activities. Our team is composed of experienced professionals who approach patients with a degree of professionalism but also the understanding and sympathy. Thanks to our clinic for patients a friendly atmosphere, conducive to their well-being and the process of recovery.